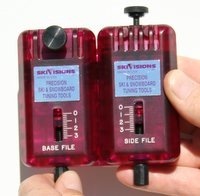 The SkiVisions Ski Sharp Edge Tuning Tool is a complex, multi-adjustable device, disguised as a simple, user friendly tool. Its purpose is to give superb edge tuning results without requiring sophisticated edge tuning knowledge or skills; the tool itself provides the sophistication. The Ski Sharp’s effectiveness is a combination of design (it works on both the side and base edge simultaneously) and the inserts (files, stones of different materials for different purposes and grits, and carbides) to give the desired edge sharpness and polish. The Tuning Stick, which comes with the Ski Sharp, lets the novice or the expert precisely analyze the condition of the edges before tuning, the progress during tuning, and the sharpness and polish of the edge desired at completion. Is ski tuning with the Ski Sharp expensive? Absolutely not. It is true that you have to make an initial capital investment in the tool and inserts, but thereafter, all inserts are re-sharpenable and RARELY need replacement. WHAT IS UNIQUE ABOUT THE SKI SHARP? WHY IS ITS UNIQUENESS IMPORTANT? 1. Grip. The ability of the ski to grip the snow at an appropriate level for the snow conditions is very important — not too grippy in soft snow, but plenty of bite in hard snow. 2. Slip. This is the truly elusive component in edge tuning. A ski must be able to slip if it is to be skied dynamically. The great Alberto Tomba, who skied with incredible power, always had the same complaint when he lost a race: “My skis were too sharp!” As powerfully as he skied, he still couldn’t overcome their “stickiness”; his tuner did not know how to tune for slip. What is an example of slip? You are half way through a turn and suddenly your line won’t work. A ski that won’t slip will lock you on that failed line. Best case, you make a bad turn, worse case, this can get very dangerous to your ACL if you are locked on and get in the back seat. Bottom line, you don’t work an over-sharp edge, it works you. An edge that will slip will let you make very quick, micro adjustments to change to a line that works. Even though the ski is fully loaded and arcing a carve, just a slight flattening of your foot is all it takes to allow you to adjust your line. The trick is to tune in both bite and slip. You can do it, but only when you know that is your objective. These instructions will show you how. The amount of sharpness is your call, since everyone is different. But if you find you can’t flatten your foot a little and adjust your line, your skis are too sharp. Snow conditions dictate how to tune for slip. It may seem illogical, but new snow has very little slip, so you have to build slip into the edge tune. That is why new snow requires a very polished edge or the they will be sticky and reluctant to slip. Old snow on the other had has lots of slip. You can run with far sharper edges and final polish is not so critical. Everything in between new and old snow becomes a judgment call and personal taste plays a big part in the decision. 3. Glide. Edges, like bases, need to glide and act slippery. Polished edge metal gives you that good glide, and the newer the snow, the more important the polish. We think of ski edges as fine cutlery, nothing less. For years we have had the above summary about grip, slip and glide. Some of our customers understand it, some find it confusing. So, let us try to attack this from a different angle. Optimum edge tuning is very elusive until you find the benchmark, which is not obvious. But, when you find the benchmark, you own the answer. It is not an intellectual question; it can only be determined by personal experience, and your personal edge tuning experiments. You analyze your muscles as you ski. That is where the secret is embedded, deep in your quads, where the benchmark hides. Your muscles need to be relaxed and fluid. That is a product of your correct edge tuning. A ski that holds you up in the turn with just enough muscle input to effortless hold you up and allow you to steer your skis. But JUST barely enough. If you are inputting EXTRA muscle just to hold you up in hard snow without slipping your edges are too dull, and, you will quickly wear down your muscle resiliency for the wrong reason. Conversely, inputting extra muscle to try and force your over-sharp and sticky into the turn edges, your tuning is wrong also. Again, muscles need to be relaxed and fluid. Over-sharp and sticky edges eat muscle resiliency as efficiently as dull edges do, you tire yourself from fighting your edges. And, they are far more dangerous than dull edges, especially to your ACL. Where you can carve hard snow with a relaxed body, both as to confidence in your skis to grip, and confidence that your skis still have the right amount of slip, so your muscles can be relaxed and fluid, that is the benchmark, and it is easy to analyze. Once you know this, you own it. HOW IS ITS UNIQUENESS ACCOMPLISHED? 1. Engineering. First, the tool may appear simple, but it is a compilation of sophisticated engineering. In over 25 years, no other ski tool has come close to duplicating it. Second, the inserts, simple and precise. 2. Instructions. Edge tuning can be complex. We simplify the process by carefully giving thorough instructions, both the why’s and how’s of edge tuning. Nobody beats the thoroughness of our instructions. First, the purpose of the Ski Sharp is to maximize efficient edge tuning results. None of us have time to waste. We need results and we need them quickly. Decide the amount of bevels you want for your base and side edges and turn the long screws at the bottome of the tool until the indicator bar shows you those degrees for both. It is that simple and accurate. When you apply the tool to the edges there are two types of strokes you can use, a single pass down the ski, which we don’t recommend, especially when using the stones, and over-lapping strokes, which we do recommend. An over-lapping stroke is a forward stroke of up to 16 inches in length, then a back-stroke of about 12 inches, another forward stroke of 16 inches, etc., which means you are slowly moving down the ski by the difference is stroke lengths. We prefer long smooth strokes rather than short choppy ones. Do not pressure on the back stroke (see below). It is important to know how to do the back-stroke. If you are using files or the Carbide Skiver, don’t pressure the tool on the back-stroke because doing so will wear the insert out quickly. On the other hand, you should pressure the tool on the backstroke when using any of the stones because the back-stroke does not cause them any additional wear, since they work in both directions. Always remember, when using the Ski Sharp, use just a light touch. You don’t have to muscle the tool as the inserts will do the job without needing excessive hand pressure. 1. It is a good idea to designate your skis as left or right. If we do that we only need to tune the two inside edges. The outside edges are beveled and kept polished, but never sharpened. Sharp outside edges do you no good when skiing so sharpening them both wastes time and puts wear on the inserts and the edges. 2. 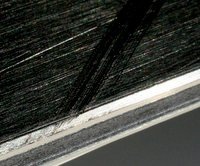 By keeping your outside edges polished and fresh, but not routinely sharpened, you can switch to them, designating them the new inside edges, when the previous inside edges get tired, rock damaged, etc. The outside edges will be new, fresh, and ready to be tuned as the new inside edges. And, this approach saves lots of ski tuning time. We mark the inside tip on the base side with a MarksaLot or a white paint pencil (depending on the base color) so we can see it easily when tuning. 1. Check your edge sharpness with the tuning stick (See All About the Tuning Stick below). Do so all along the edge because you need to know your starting point. You will find the ski dullest under foot, with progressive sharpness out towards the tip and tail, exactly what you don’t want. 2. Sharpen and de-burr with the green stones. Use the procedure outlined below under Zoning It is the most important tuning procedure to follow. Start under-foot, not at the tip, and start polishing the edges with a back and forth movement with the Ski Sharp with just light pressure on the tool. The stones don’t need pressure to cut, you can feel them cutting and polishing through the Ski Sharp. After about 5 back and forth passes under-foot, slowly start working your way out towards the tip and tail, adding more distance out after every several passes, until you have progressed all the way to tip and tail. 3. Check the edge sharpness with the Tuning Stick, you should now find that the edge has become sharpest under-foot, with progressively less sharpening out towards the tip and tail. This is exactly what you want. The bite of the ski comes from its ability to bite under-foot. Keep in mind, when you are tuning with stones, you are never removing excess edge metal as you can do with files — you are only removing enough to make them just right. 4. If the edge is not as sharp as you want, you have two choices. We first like to use the green stones to see if the correct sharpness can be achieved with them. If not, and this is important, put a file or a Carbide Skiver in just the side file pocket, keep a stone in the base file pocket. Again, start under-foot several passes and then work outwards towards tip and tail just as you did previously. Don’t over-do! Also, keep in mind, when you generally tune your edges with stones, the metal remains conditioned and cuts easily with files or carbides. A little of this procedure goes a long way. Stop frequently and check your progress with the Tuning Stick. Then, return to the green stones and re-do the edge again, starting under-foot and working your way out. By now you should have a very sharp edge with a micro burr. 5. Edge polishing is next; the desire for the amount of polish varies both from skier to skier and the snow conditions. This also is the point where the Tuning Stick really performs. In new, fresh cold snow, always polish. In old, icy, or hard man-made snow, you may like the finish of the green stones, they give you a distinct communication or feel of your edges on the snow. Highly polished edges won’t do that. Everything in between is personal preference, you have to experiment and find what you like. 6. Polishing tip and tail. The final edge tuning step is to polish off the sharpness of the edges at tip and tail. If the edges are sharp at the tip and tail they will be grabby and the skis difficult to control. We recommend polishing the tip and tail plus one inch past the contact point, which is the point at which the skis are the widest at tip and tail. When polishing one inch behind the contact point (going towards the bindings) you give the ski a little extra forgiveness without sacrificing performance. The picture shows detuning at a 45 degree angle polishing the tip of the edge with our ruby ceramic polishing stone. Once this is done they only need to be re-polished periodically if you use the Ski Sharp with our recommended techniques. 1. Base edge bevel makes a ski more forgiving and the edges less “sticky”. They feel as if they have better glide and they transition better in the turns, so you “catch” edges less frequently. Generally, this translates into a quicker and more forgiving ski, giving you greater confidence. However, if a little is good, more is not better. Greater base edge bevel will make your edges feel less sharp on hard snow because they have to be angled higher for the tip of the edge to be able to bite. You have to experiment to find what you like, and the snow conditions where you ski will influence your decisions. For instance, hard snow skiers generally like less, powder skiers more base edge bevel. 2. Side edge bevel has only one purpose: to adjust the sharpness of the edge, the greater the bevel (say 3 degrees) the harder the ski will bite, which is good for hard snow but too much for soft snow. The hardness of the snow where you generally ski dictates how much side edge bevel to use. Keep in mind, on the side edge, 1 degree is also 89, 2 degrees is also 88, and 3 degrees is also 87, all depending on your point of view. 3. Beveling purposes and effects are no more complicated than that. The Ski Sharp, together with the Base Flattener, lets you experiment to find what you like. 4. So what are the bevel selections for a very sharp ski? Base edge bevel at 0 and side edge bevel at 3. A selection that should only be made by very hard snow skiers. This selection also makes for a very unforgiving ski, particularly if your boot canting is not correct. 5. So what are the bevel selections for a relatively dull ski for soft snow and powder? Base edge bevel at 2 and side edge bevel at 0. This keeps the ski from biting too hard in soft snow. You should always first tune your ski according to the manufacturer’s original bevel settings; your ski shop can get this information from the factory rep if it is not well known. Using the Ski Sharp to maintain factory bevels is very easy to get started with when using the tool. If you find you want the ski to act differently than it does with the factory settings, experiment, it is a little work, but well worth the effort, especially as you develop your own tastes. Only the files or Carbide Skiver will cut in bevels, not the stones. The files are OK for that purpose, but if you do a lot of edge tuning, get one carbide skiver – it will last virtually forever and cuts in precise bevels. Only one edge bevel should be set at a time, particularly when cutting in base edge bevel. That means only one file or Carbide Skiver in the base file pocket. It is best to have nothing in the side file pocket when first cutting in base edge bevel, you want to feel the cut, and in particular, you want to feel when the cut is finished Then you know the bevel is set. Base edge bevel is cut in until the file or carbide skiver stops cutting. Both the feel of the tool in your hand and the sound it makes (or doesn’t make) will tell you when the bevel is cut in. Side edge bevel is cut in using a file or Carbide Skiver in the side pocket and preferably a stone in the base pocket. To cut in side edge bevel you can usually plan on taking about 10 passes per edge, but you cannot measure your progress, and the file or carbide will just keep cutting, so limit the number of passes down the ski – don’t get carried away. Keep in mind, when you are cutting in bevels, you are creating micro burrs, and those burrs can only be taken out with lots of polishing the edges with stones, the finer the better. Remember, once your bevels are cut it, they will keep their angles with normal tuning. If you just tune with stones, you may want to check the base edge bevel periodically with a file or carbide, but the Ruby Sharpening Stones will generally maintain bevels through regular tunings. The Tuning Stick which comes with the Ski Sharp is a simple plastic rod, but don’t be fooled, it is a sophisticated analytical tool, it allows you to precisely “read” the sharpness of your edges and the presence of micro burrs. As you are tuning your edges, it is easy to get “lost”, that is, not really know where you are. The Tuning Stick solves that problem because it will always tell you the sharpness and burred condition of your edges, and you can always get consistency from ski to ski. It takes the guessing game out of edge tuning. Before you begin tuning, check your edges with the Tuning Stick. You will see how they are more dull under foot than out towards tip and tail. You will also find out that, unless you are in soft snow, one day is all it takes to lose the sharpness under foot and, keep in mind, under foot is where you want your ski to be sharp; it is where all the skis’ grip and bite and “sting” comes from. Once you start using the Tuning Stick, you will quickly realize the benefits of frequent tunings. Daily is the norm unless the snow is soft. You spend a great deal of effort and money to get on the hill, not taking every advantage once there does not make sense, tuning really pays when it comes to on the hill fun. And once you get the hang of it, it only takes a few minutes. We HAD to develop the tuning stick because our edge tuning techniques and advice are unconventional, so we needed to develop and easily observable way to analyze edges while they are being tuned and which could be used to parallel our advice without guesswork. Hence, the tuning stick was developed for that purpose. 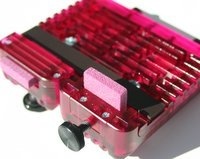 Our edge tuning methods are totally inconsistent with other tuning advice you are likely to hear, even the names the other tool manufacturers choose for tools indicate that they really don’t have a clue what edge tuning is really about. In edge tuning, more is not better. Better is better, and better only comes from an approach where ski edges are honed with precision and polish, not a mangling, using a tool size and insert lengths that interface correctly with shaped skis. “Zoning” the sharpness of the edge, as discussed below, can only be repeated ski to ski if you have the capability of analyzing the edge; zoning cannot be executed effectively without the Tuning Stick. Hold the Tuning Stick at 45 degrees to the edge and push down on the stick (don’t pull it up) with moderate pressure, something more than just light pressure, and shave plastic. The Tuning Stick will give you three sensory observations (see below) which allows you to be very precise with your edge tuning. If you only use light pressure on the stick you will only be reading the burr, heavier pressure really shows you how the ski will bite, especially in hard snow. 1. If the edge is sharp and polished, the edge will shave plastic off the stick in a smooth and consistent manner, its sound will be smooth and consistent, and it will vibrate a little. 2. The amount of shaved plastic will demonstrate the level of sharpness and is easy to observe. 3. If the edge is dull, it will not shave plastic, and the dullness will be very apparent. 4. If the edge is burred it will shave plastic very aggressively, and the Tuning Stick will also vibrate and make a squealing sound. 5. The Tuning Stick gives you three sensory observations, visual (observe shavings), feel (vibration), and sound (range of smooth scraping to squealing). There is no comparable method for analyzing your edges. One of the problems with the Tuning Stick is that tuners can become so intrigued by it, and the way it shaves plastic, that they have a tendency to over-sharpen their skis, to over-tune their skis, playing with the stick. If you notice yourself doing this, back off. Keep in mind, the construction of your ski will determine how sharp you can tune it; it is a little known fact that not all skis can take the same sharpness. Skis that are very damp can be tuned much sharper than skis without much dampening (powder skis and the like). Why is this the case? Because skis without dampening vibrate when you set your edges in hard snow, they then literally vibrate out of your edge set (you lose grip). If you tuned those edges very sharp, they then immediately bite in again but again vibrate out of the edge set. Consequently, you get a very rough and unstable ride. A dampened ski will bite with the edge set and won’t vibrate out, so the edge set holds for a great carving turn. The point is, if you have an un-dampened ski, don’t try to make it a hard snow ski by making it very sharp, you won’t like the result. Also, if you use your skis on the rails, you ruin your edges and they can’t be kept properly sharpened. We suggest that if you like the rails, get a dedicated pair of skis and don’t bother tuning them, and never use your good skis on rails. This is a special note to racers or others who don’t tune their own skis. Even if you don’t tune your own skis, you need to be able to analyze your edges to see if they are properly prepared. The Tuning Stick is your best way to do it. You will be able to precisely analyze the job your tuner is doing for you, and, you can learn exactly how you like your edges. In other words, you are no longer a “victim” of your tuner. And, if you can’t get what you want, you might have to do it yourself, but then it is easy, we show you how. The reason ski racers are so prone to blowing out ACLs is because no slip is tuned into their skis. Now we have no doubt every racer says, I don’t want any slip, it will slow me down, won’t let me hold a carving edge, won’t let me hold the arc of the ski, etc. CORRECTLY TUNED IN SLIP DOES NOT COMPROMISE ANY OF THOSE CONCEPTS. You can still carve without slipping, but you have a far larger quiver of possibilities when you have some slip built into your edges. When skis have no slip it is easy to get caught in the back seat in a way that prevents the possibility of escape — you just keep getting dragged deeper into the back seat, until POP. Goodbye ACL. Slip gives you a degree of safety as well as agility and quickness. Use the Tuning Stick to not only manage your tuning, but to also manage your safety! You want to win races? You think speed is about waxing? Nope. Winning is about confidence, that confidence comes from your edge tune, proper waxes just makes the most confident go faster. Our edge tuning techniques are all about confidence in our skis, their performance is predictable, the edges have grip, slip and glide as we discuss. And when you have absolute confidence in your edges, you are in the mental condition to win, to enter the zone. If you really “get” that edge tuning is a perfect balance of grip, slip and glide, and you learn how to effectively analyze your edges with the Tuning Stick, the last step is “zoning”, the method to make your skis magical. Ideal ski tuning makes it float like a butterfly, sting like a bee. If you want that effect, zoning is required. The beauty of the SkiVisions approach to zoning, though, is that it is easy; anyone can do it! The sting comes from a sharp ski edge under-foot and the float comes an edge that is progressively less sharp out towards the ends. 1. The 20 inch section under-foot is tuned sharp. 2. The other 20 inch sections (shovel section in front, tail section in rear) are tuned progressively less sharp. That is done by using overlapping strokes with the Ski Sharp wherein you do fewer repeats as to move towards the tip or tail. Fewer repeats means less work on the edge and less sharpening. This is point loading. There is nothing new with the concept of point loading and ski tuning, but the SkiVisions approach is both unique and the most effective method of producing and controlling point loading using the Ski Sharp, Tuning Stick, and the SkiVisions tuning techniques. Keep in mind, when zone tuning the edges, frequently checking your progress with the Tuning Stick is critical to track your progress and to accurately compare your edge tuning from ski to ski. Ski Sharp Files. These are the newest Ski Sharp files as of 10/2012. They are designed to give aggressive edge cutting yet excellent finish. It is the biggest, most aggressive file we have ever made for the Ski Sharp. Note the black dots, the file must be placed in the tool with the dots facing the same direction and the tool used in that direction. Files only cut in one direction. This is not a chrome plated file so it can be re-sharpened with the acid soak method shown in the maintenance video. If you look carefully at the files in the picture you will see dots of black markings at the leading edge of each file. IT IS IMPORTANT THAT YOU FOLLOW THIS INSTRUCTION. Those dots need to be facing the same direction and the tool needs to be also used in that direction for the files to cut edge metal. It is important that you use the files in the correct direction only and that you do not pressure the tool on backstrokes when using over-lapping strokes; pressuring a file against its cutting teeth (facing the wrong direction) wears it out quickly. Brush the metal filings out of the file teeth frequently. If they are loaded up they won’t cut. The sharpening stones only work if you continually adjust the stones to a fresh section of stone. This picture shows a Ruby Ceramic Stone that is NOT fully inserted in the side edge pocket. It is important to move the side edge inserts up and down in the pocket frequently to maximize the life of the insert and to keep using fresh stone sections to maximize its performance. The inserts also need to be rotated in the pockets to further maximize their usefulness. So, after each pass down one ski edge, adjust the stones to a fresh section and continue. Frequently changing the stones’ position to fresh stone grit is the secret of sharpening with stones. Green Stones. The green stones are aggressive silicon carbide stones that love to eat hard metal. They are intended to replace files for general edge sharpening purposes. NEW SKIS. See the index regarding tuning new skis. These stones are for working edges that have been hardened at the ski factory from misuse of the tuning equipment. HARD SNOW. You may find you like the final finish of the green stones in very hard snow. Polishing Stones. The purpose of polishing stones is to allow you to polish your edges to a finer finish and to remove any traces of burr. We have consolidated the ENTIRE polishing process into one stone, our new fine green polishing stones, and have thereby eliminated the need for progressive stone grit polishing. They are incredibly effective at accomplishing the entire spectrum of polish and burr removal in a single stone. 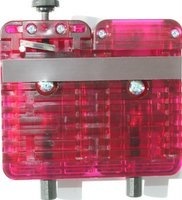 They are constructed of the finest ruby aluminum oxide and glass. We love simplicity, these stones get us there. NOTE: The pink Ceramic Stones have been replaced with new and improved, Fine Green Polishing. They look similar to the coarse Green Stones. The Coarse Green stones are denoted wit a ‘C’ on their edges, while the Fine Green polishing stones have an ‘F’. Carbide Skiver. The Carbide Skiver is a cutting insert as are the files. However, they are used only one at a time! A stone can be used in the other pocket when using a carbide, never another carbide, it is too much, over-kill. But unlike files, they can be re-sharpened (see below) an infinite number of times, and they can be rotated to use up to 16 cutting surfaces before needing re-sharpening. You can observe these two cutting edges on the carbide that show wear, one edge more than the other. As carbide edges wear, they get rounded and shiny. This carbide will need re-sharpening soon. (See Maximizing the Life of the Inserts below) If you do a lot of cutting with the Ski Sharp, get a Carbide Skiver, they cut edge metal like butter and last forever. They are a one time investment. The Carbide Skiver feels relatively dull and ineffective if you roll it in your fingers, but don’t be fooled. It is a very aggressive cutter because of its relative hardness to the ski edge. It is easy to “over-do” with the carbide so use it with care and be conservative with it. Use it with a light touch, let it cut at its own pace, don’t rush it. 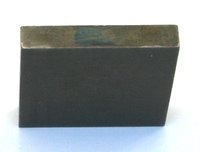 The Carbide Skiver is a flat carbide blank, this makes it re-sharpenable an infinite number of times. However, a white plastic shim piece needs to be used with it to create a cutting tooth. This is the Carbide Skiver in the base edge pocket. This is the Carbide Skiver in the side edge pocket. Again, notice the white shim piece used to form a single cutting tooth. Keep in mind, the Carbide Skiver is mostly used in the side edge pocket for sharpening purposes. The Carbide Skiver is used in the base edge pocket only when cutting in base edge bevel initially and perhaps occasionally when re-checking base edge bevel. It is important to use this insert correctly when cutting in bevel! Cutting in bevel requires a number of passes, taking some edge metal each time, until your bevel selection is achieved. However, if you continuously use the carbide in one direction you will develop striation lines on your edges, small lines that look like skip marks. You can avoid this by reversing direction with the carbide each pass along the ski. Say the first pass down the edge is cutting from tip to tail. You should then reverse the carbide in the Ski Sharp and cut from tail to tip. 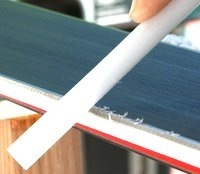 This way you prevent the striation marks in your edges. The Carbide Skiver leaves a very nasty burr. After using it, major polishing is required to remove the burr; you can also polish it out lightly by hand. The Carbide Skiver is not for cutting through rock damaged edge sections. Rock damaged edge sections must first be polished thoroughly with the green or 180 grit stones. The Carbide Skiver needs more care when re-sharpening since the process is done up on its narrow edge rather than on the flat surface. There are 16 cutting edges that you can use on each carbide, and you can observe when they are all worn. Close inspection will show worn areas and a shiny edge. When re-sharpening it, it is important to hold the edge very balanced on the diamond file while rubbing it back and forth so that there is no rocking the carbide side to side. There are two ways to maximize the life of the inserts. We are showing the Ruby Ceramic Stone raised up in the side edge pocket, that is, not fully inserted. This allows you to get extra life out of the stone and to make quick, frequent adjustments to the stone so that fresh stone grit is always being used on the side edge. The side edge is where all the real work in edge tuning is done. This technique is used when using either files or stones. 2. Second, re-flattening and re-sharpening the stones and the Carbide Skiver (see Stone/Steel Inserts Maintenance). We call rock damaged edges invitations to obsessive behavior. Many tuners think they have to polish them out, that edges have to be pretty to be correctly tuned. Don’t do it! You can clearly see the sheen of a finely polished edge and the ugliness of a rock scar. Every time you hit a rock you diminish the effectiveness of your edge. That is just the way it is. Don’t make it worse (expand the damage) by fiddling with it. Polish it out to the extent you can with the green stone IN THE SKI SHARP and some final polish with the ruby ceramic stones and that is all. Leave it alone beyond that. Why? If you attempt to polish it out by hand, you will also round off some of that nicely polished edge, exactly what you are trying to preserve. Don’t make your edge tuning a version of cancer surgery where you have to take some good tissue to prevent the spread of the damage! Remember, you can sharpen a rock scar so the edge then works, you just cannot make it pretty. And, as you continually flatten the ski and tune the edges, eventually the rock scar will disappear. Let it go at that. Don’t polish it by hand. This is the SkiVisions tool for cutting back the edge protector. It is the SkiVisions Base Flattener steel blade and it is very sharp, we grind each corner of the bar so there aren’t any sharp edges that can dig into your ski sidewall. The ends of the bar are very sharp and easily skives off edge protector plastic. There is a narrow strip of plastic just above the top of the ski edge and you can observe it in this picture. The problem is that, as you are tuning the ski, particularly if you use side edge bevel, that plastic clogs the inserts and slows the tuning process. We like to skive it off on our skis a little at a time so that it is still there, doing its job, but it is out of the way when tuning. By angling the steel blade we can push it down the edge, easily skiving off the plastic only so that it is out of our way. Since we only take off a little at a time, this needs to be repeated from time to time, but it only takes a minute to do. 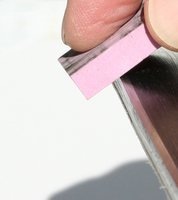 Note, some manufacturer’s use a plastic type coating on their skis, cutting back the plastic coatiing is more easily done using the same technique but using one of the Base Flattener Ruby Stone Blades instead of the steel blade. 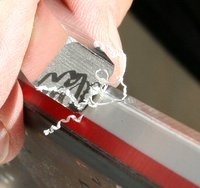 If the steel blade is reluctant to bite and cut, wants to jump once it is cutting, or generally doesn’t want to make smooth cuts, try the Ruby Stone Blade instead using the same technique — it will work better. We know not everyone is interested in technical stuff, so this is just for those who are. Lubricants. Should you use lubricants when tuning ski edges? Lubricants range from water to honing oils, etc. ABSOLUTELY NOT! Why? While it is true that lubricants help the cutting action of stones, the problem is, when you are tuning edges you are constantly producing “trash” in the forms of metal and dust, if you use lubricants, you promote driving the trash into the base pores, whereas if the stones are used dry, the trash can simply be wiped off. All of the SkiVisions stones are designed to be used dry, never with lubricants. Checking base edge bevel and converting to degrees. To measure base edge bevel all you need is an automotive feeler gauge like the one shown, and a true bar. You are reading the gap between the true bar and the tip of the edge. If the feeler gauge can insert into the gap, go to a thicker gauge, until it no longer can be inserted into the gap. The prior thickness is then the amount of bevel in thousandths of an inch. You can convert that gap to degrees using the chart below. 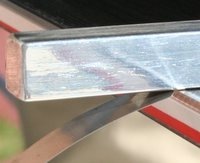 It is unfortunate that base edge bevel was originally expressed in degrees because it is meaningless without also identifying the starting point, 1 degree with a 3/32 of an inch starting point in from the tip of the edge, as we have used on the Ski Sharp, is a good measure for base edge bevel in degrees, and is the basis for the conversion in the chart below. If the start point was, say, 1/2 inch from the tip of the edge, the ski would have so much bevel it would be un-skiable. What is important when measuring base edge bevel is the distance as measured by the feeler gauge shown above rather than the degree of angle. The following chart shows the thousandths of inches measured by the feeler gauge comparison to the degree setting on the Ski Sharp (base edge). Keep in mind, anything over .005 (2 degrees) means that the ski has to be tipped very high on edge to get the edge to bite, something that should only be done by tuners looking for a specific effect. Also, keep in mind that if you frequently ski very hard and man-made snow that your inside edge will wear very quickly, meaning, the base edge bevel will INCREASE due to that wear. When that happens, you need to flatten the entire base with the SkiVisions Base Flattener with ruby stone blades to bring the entire base and edges in proper plane with each other. The easiest way to track edge wear on the inside edge is by using this feeler gauge technique. We carefully set each Ski Sharp base edge file at true zero, it is the basis for the accuracy of the tool and we designed adjustability into the base file clip for that purpose. Here is how we do it. To check if your Ski Sharp base edge is set at true zero, first turn the base edge bevel screw on the top to zero and tighten the screw on the underside all the way so the base plate is snug to the base file holder. Then using a true bar, slide it along the base edge file and along the base piece of the tool to see if the true bar just “kisses” the file, it brushes the file so that you know it is precisely on the same plane as the base piece of the tool AND as you pass the true bar off and back onto the file there is no “clicking” at the edges of the file. Remember to once again loosen the screw on the underside about 1/2 to 1 turn so there is some play for the adjuster range. If the true bar is not “kissing” the file, and/or it clicks as it travels off and onto the file, the base clip needs adjusting. Using a #1 Phillips screwdriver, adjust the two small screws until the true bar makes precise but not excessive contact with the file. Any turns of the screw are VERY minor, usually less than 1/16 turn. Maintain a firm grip on the Ski Sharp and keep your fingers away from the sharp metal ski edges. As said before, and as your Ski Patrol knows, edges are cutlery. Your ski must be held in a ski vise when using the Ski Sharp. Keep the tool clean and replace any worn or damaged parts. The following videos relate to how to use the Ski Sharp.